Auto Sector is one sector that I am going to stay away from in general during this recession. However, I think Hero Honda deserves an exception. This is one reason why I added this stock to Best Stocks to Invest in 2009 list. Why is Hero Honda the BEST auto stock? First lets look at some technicals. Look at the price volume chart of Hero honda for the past one year. While majority of stocks and Nifty have lost over 50% value in the past one year, and still moving downwards, Hero Honda has given over 26% returns in the past one year. Here are two main reasons why I think this stock deserves a portion in my portfolio. Although auto sector and in general Hero Honda is showing slowdown signs, the stock is trading merely at a P/E of 15 as I write this post. 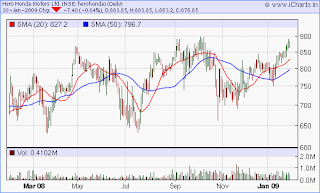 Click on latest P/E ratio of Hero Honda to find the latest. Low petrol prices and lowering interest rates work in favor of this stock. Note, Hero Honda's net profit grew 10% in Q3 2008, however sales dropped by 11% indicating a slowdown in Hero Honda's business. As mentioned earlier it is a good idea to stick to diversification and not put all your money in one stock. wow its great news that hero honda India is Best Auto stock to Invest in 2009. i had already invest in the hero honda.